If there’s one scene that best captures the sense of hallucinatory wonder of watching HBO’s The Young Pope, it’s a vision that the Pope has in the season finale. As the very premise of the show more or less telegraphs, Jude Law’s Lenny Belardo is a character imbued with the unshakable self confidence necessary to stir change—in this case, reversion as opposed to progress—within one of the most staid and implacable institutions on the face of the Earth. He only became the Pope after sparring factions within the clergy compromised and agreed to elect him in hopes that the placid, guileless young Cardinal they believed him to be would act as their puppet, but he is far too singular of a person to accept a diminished version of the office. The first few episodes are the funniest, as an uncannily dapper Law swaggers through the Vatican, confounding Cardinals and generally making a show of dunking on anyone who offends him in ways large or small. It’s a satire, but a subtle one. 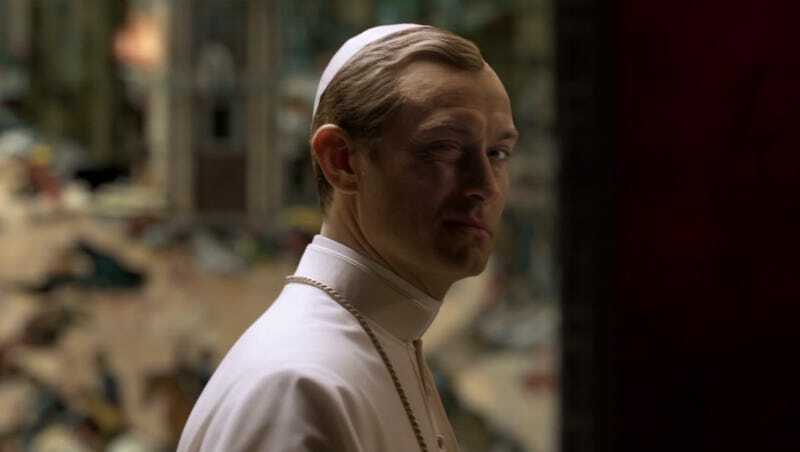 You get the sense that the young Pope is winning and that the church will eventually operate in his image. Of course, that backfires and leaves the Vatican with a quasi-fundamentalist in charge who’s prepared to drag the church back to the 13th century. The church struggles with a religious literalist at the helm of the ship, and Pius XIII’s staunch refusal to lead in deference to the values of modern society threatens to take the church down the path of obsolescence. But even the man formerly known as Lenny Belardo is not stern and uncompromising enough to truly destroy the church from within, and eventually comes to understand that much of his authoritarian streak came as a defense against his fear of choice: choosing where the church should go in these constantly changing times, choosing the direction of all the lives under his control, even choosing who he is himself. As an orphan, the young Pope had no familial examples to model his core self after, and thus decided to adopt the unyielding values and austere temperament of the old Catholic God. When he rejects his predecessors’ advice in the season finale, he is accepting his own smallness. It’s not enough to simply believe in God, or even yourself, to lead the church. The ideologue gradually softens and in doing so he truly finds God for the first time. On its face, that all sounds overwrought and boring. Make no mistake: The Young Pope is more of a comedy than anything else. Its campier elements are dispersed evenly between long soliloquies on the nature of God, but there’s comedy to be found even in the show’s most pensive moments. (And not just in Law’s increasingly bizarre and uneven American accent.) Before the Pope greets the College of Cardinals and implores them to adhere to his rigid, anachronistic vision for the church, there’s a montage of him getting dressed in his blinged-out Pope outfit to a LMFAO song. When he goes to meet a child whom he basically willed into existence by demanding from God another immaculate conception (like I said, it’s campy), he breaks the rapturous spell of holy birth by dropping the baby on his dumb noggin. Lenny does change over the course of the show, accepting a gay priest to serve as his right-hand man and showing his face to the adoring public instead of remaining invisible, but he only compromises so much. The struggle between ideology and practicality is a central theme of The Young Pope, one that director Paolo Sorrentino renders with convincing nuance. Pius XIII does not reach a grand holy realization and flip-flop on abortion or gay marriage and he doesn’t cave in the face of enormous public pressure, but he softens around the edges. For a show utterly in love with heightening and sanctifying the absurd and the banal, its main character is charmingly human, even if he is a saint. “Affliction changes us,” Pius XIII tells a Cardinal at one point. To read the show as just a meditation on the rigidity of belief and the church would be an oversimplification. The Young Pope at times flirts with being all number of different shows; a tale of internecine power struggles for control of the church; a love story where holy men must choose between God or their fellow humans; a meditation on abuse; an exploration of miracles and the power of God. The show’s most heartbreaking episode ends with multiple lives touched by abuse lurching on the precipice, but the next one starts with a gorgeous shot of a snow-dusted Vatican and an audio reveal that a potentially damning skeleton in the Pope’s closet has only strengthened him. There is no unifying momentum to The Young Pope and it’s all the better for it. Sorrentino recognizes the absurdity at the heart of a show about a young hottie of a Pope and he trusts viewers to ride out the tonal whiplash and enjoy his shimmering mirage of a show. While Jude Law smirks and huffs cigarettes and chugs Cherry Coke Zero™, the show never veers into outright self-parody. Lenny performs actual miracles, but he occasionally loses track of reality while fixating on his long-lost parents. You’re not exactly supposed to like the young Pope or even agree with him, but his charisma and absurd self-regard are why the show works so well. He’s a bundle of contradictions and the show would collapse around him if he wasn’t such a forceful, inscrutable character. What The Hell Is Westworld Gonna Do Next Season?